Choosing between a Toyota car and a Toyota SUV near Hyannis can sometimes be difficult. Once you think about the pluses and minuses of each body style, you could still have questions. Not only do you need to consider space, fuel-efficiency, and features, but you also need to consider which one you’ll be comfortable with years down the road. At Balise Toyota of Warwick, we’re here to help you decide. Sedans are popular around the Warwick and Providence communities. Even though cars tend to be smaller than SUVs, you’ll discover that our lineup of Corolla, Camry, and Avalon sedans are quite spacious. You’ll even be pleasantly surprised with the amount of space found inside one of our Yaris models. Plus, sedans make navigating narrow roads a breeze! With a Toyota SUV, you will be able to tow and go off-roading, especially with one of our 4Runner models. More families around Pawtucket, North Kingstown, Coventry, and Cranston are discovering that SUVs are the better choice for long road trips. SUVs like the Highlander or Land Cruiser provide better visibility when driving. Now that you know what sets the two apart – What will it be? A Toyota car or a Toyota SUV? 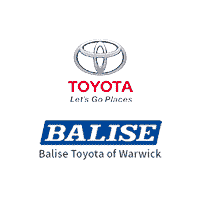 If you’re still not sure, we recommend taking the trip down to Balise Toyota of Warwick for a test drive.